Read about his incredible start on life and how so many people stepped in to make his life possible. BenMar Banks Amadeus, RIDSH passed his 2003 inspections with flying colors, earning these comments from the judges: "Highly Attractive Horse" and "Destined to do Great Things!" Amadeus is a rare individual. Some of his outstanding achievements include: 1st Place Best Partbred, 1st Place Best Get of Sire and Reserve Champion - Partbred In Hand at the 2001 National Irish Draught Horse of North America Breed Show. 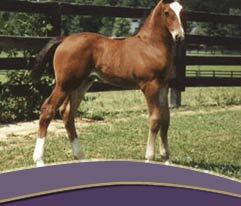 Bred and raised at BenMar Farm, Amadeus has proven to have the most exceptional and personable temperament. He absolutely thrives on attention, loves to show and is extremely easy to train. Amadeus consistently demonstrates a great willingness to perform and please his amateur handler. Currently he is going extremely well under saddle for his current owner in New York.